As a long-time publisher of the photo-art of Justin Hamm, I find his images of solitary farm tractors, silenced railyards, abandoned autos, wayworn signposts and other time-defeated places, offer intimate connections with Midwest Americana. The photos form a synthesis that goes beyond any mere aggregate of cultural artifacts. Through superb depth of field, clarity and precision, the scrutiny of his camera links past and present, bestowing to the viewer an intimate, poignant, often spectral, aura of transience. This engaging collection comes with my highest recommendation. Heartland born and raised poet and photographer Justin Hamm has taken his camera into the prairies and watersheds of the Midwest, and to be frank, the world is a little bit better because of it. In a country divided by politics and paychecks, Hamm’s work offers us some respite by showing us the poetry in his subjects. 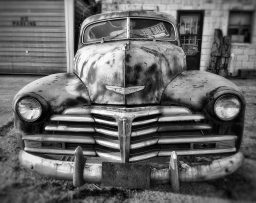 The rusting farm trucks, tractors, silos, and old barns not only highlight the rough-hewn beauty of the American breadbasket, they also help to remind us that at our core—both geographically and spiritually—there is beauty in the ruins.